People who have hypothyroidism can also experience foot pain related to their condition. The pain can come from the joints as well as the foot muscles, both of which are impacted by an abnormal thyroid function. Read on to learn more about the effect of hypothyroidism on foot pain. Hypothyroidism is a health condition in which the thyroid does not create enough thyroid stimulating hormone. As a result, the thyroid is underactive and functions too slowly. It can also cause tarsal tunnel syndrome, which is a painful condition of the feet. Tarsal tunnel syndrome causes pain in the arches of the feet, pain in the toes, and a burning and tingling sensation in the feet. The pain tends to get worse with activity. It is common for people who have hypothyroidism to experience joint-related problems and muscle problems. The muscles swell, which puts pressure on the nerves and creates the sensation of pain. Hypothyroidism also causes arthropathy, which means that the joints become stiff, achy, and inflamed. Hypothyroidism can result in tarsal tunnel syndrome. Tarsal tunnel syndrome occurs when a nerve in the foot is compressed or damaged. It can also be related to a damaged muscle in the foot. As a result of this nerve damage, the blood cannot properly circulate in the foot. As a result, patients may experience pain the toes, ankle, and foot. Hypothyroidism can result in some painful foot conditions. However, there are treatments available that will minimize the pain. Many patients find that wearing orthotic shoe inserts is quite helpful. If you have hypothyroidism and foot pain, you should visit a specialized shoe store and be fitted for custom arch supports or orthotics. These devices are custom made to fit your feet. They are then worn inside your shoes to give your feet the added support that you need. If you suspect that you may have hypothyroidism, you should see a doctor to be tested and properly diagnosed. Do not rely on your own suspicions to establish a diagnosis of hypothyroidism. It is important to see a doctor to be accurately diagnosed and rule out any other possible concerns. Your doctor may recommend additional treatment options, such as steroid injections. Steroid injections serve to reduce inflammation, which helps to reduce pain. Anyone who has a health condition that can contribute to foot pain should be particularly careful to take good care of their feet. Go to a specialized shoe store to purchase your shoes, and have your feet professionally measured there. Feet often change in size as we age, and you may find that you aren’t wearing the proper size. This factor alone can contribute greatly to foot pain. Have your feet measured every time you purchase new shoes. When you shop for shoes, go late in the day, when your feet tend to be largest and most swollen. Don’t let foot pain keep you from participating in the activities that you enjoy. There may be times when you need to rest, but overall, it is best to remain as active as possible. Frequent activity is good for maintaining your flexibility and mobility. Do whatever you can to make activity comfortable, such as wearing comfortable shoes, (and) using orthotic devices, and remaining active. If you have foot pain related to hypothyroidism, visit Foot Solutions. 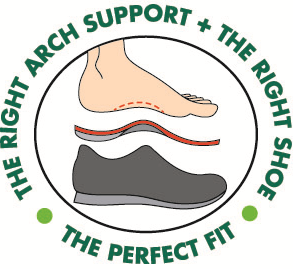 We can provide you with custom arch supports & comfortable shoes to get you the perfect fit and the comfort and support that you need. Call in to Foot Solutions to check out the options today.